Knock On Any Door was the first film Ray directed for Humphrey Bogart's production company, Santana Pictures. 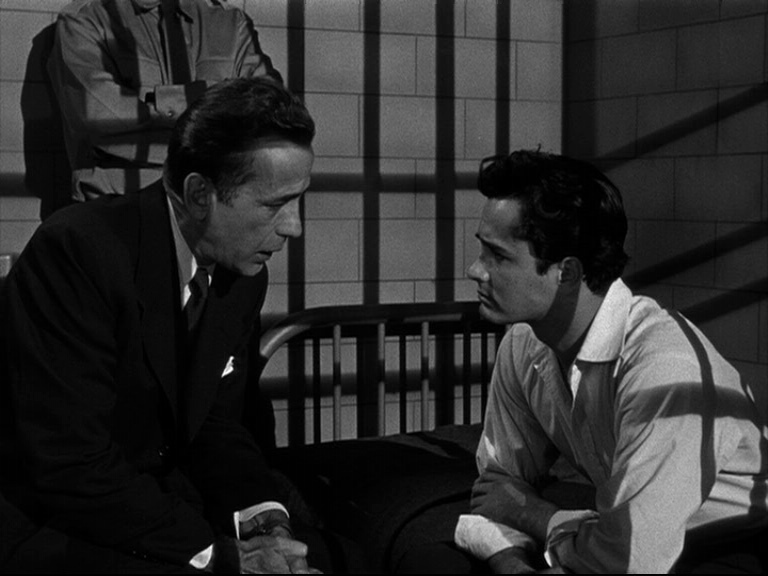 Bogart stars as defense attorney Andrew Morton, one of the few success stories to come out of his dangerous Skid Row neighborhood. So it's understandable at least why he doesn't hold much sympathy for Nick Romano (Derek), a young hoodlum that also grew up there, who despite his good looks and charm inevitably finds himself in trouble again and again. In part, Morton blames himself, for failing years earlier to keep Nick's dad out of prison, where he is killed. With no breadwinner, Nick's family ended up in the slums, starting the young man on a road of petty thievery and misdemeanors which culminates in his arrest for the murder of a cop. A courtroom film, much of the story is relayed in flashback as Morton describes the series of misfortunes that befall Nick (in this respect, the basically decent but unlucky Nick resembles They Live by Night's Bowie). Only after Nick is found guilty and sentenced to the electric chair does Morton realize that Nick's path was shaped by the failures of the criminal justice system (Morton included) to properly guide the boy through his tumultuous adolescence. Though most overtly a social conscience film, and a forerunner to the type of youth genre Ray would spawn with the release of Rebel Without a Cause, Knock on Any Door rightly belongs amongst the other noir films Ray was directing in this early period. There is a dispiriting cloud of predestination hanging over Romano. The confining soundstage which doubles for Romano's neighborhood is representative of the limited options he has available to him. And Romano is self-aware enough to know his fate: his motto is "Live fast, die young, and have a good-looking corpse." Like the traditional noir protagonist, there is the sense that Romano has nowhere else to go but down. Ray reworks this basic setup in Run for Cover (which I reviewed here some months back). 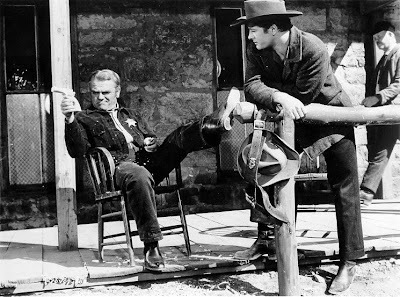 James Cagney plays Matt Dow, just freed after spending six years in prison for false charges. Heading towards the small town of Madison for a fresh start, he meets young Davey Bishop (Derek) who is soon to embark for grander vistas away from Madison, where he grew up. Dow and Davey get into some trouble when the locals mistake them for train robbers and shoot Davey, one of their own. Crippled, Davey falls into a pit of self-loathing, while Dow blames himself for getting Davey shot. Dow falls for Helga (Viveca Lindfors), whose father's homestead becomes a refuge for Davey and Dow while the young man recovers. Dow becomes town sheriff after teaching the locals not to judge so quickly. He makes the lame Davey his deputy hoping to build up his confidence. But Davey begins to envy Dow's optimism, his stability and his promising future with Helga. In much the same way Derek's character Nick is unable to put his impulsive ways behind him in Knock on Any Door, Derek's Davey can't imagine a future where he can succeed with his new physical impediment. Run for Cover's setting may be as open and expansive as Knock on Any Door's is closed and oppressive, but its young, troubled protagonists are both limited by their lack of opportunities, ambition, and faith. Interestingly, though Ray cast Derek as both of these similar characters, six years between these two projects may have shifted the director's take on this archetypal character. Knock on Any Door more evenly splits its point of view between the surrogate father, Bogey's Morton, and the unappreciative son, Nick Romano (his name bears a strong resemblance to Ray's, as many of his other films' protagonist's do) who Ray often forces us to identify with. In Run for Cover, the story is firmly seen through the eyes of Cagney's Dow, as decent a Ray hero you'll find this side of Jesus Christ in King of Kings. It's an interesting journey Ray takes us through on his continuum of juvenile delinquency which would bear fruit in his next film, the most nuanced of all his takes on youthful alienation, Rebel Without a Cause.